Ex-Milwaukee Road 356-365; w/o dynamic braking. #8858-8859 wear a special bi-lingual Vancouver 2010 Olympics celebration banner; "Canadian Pacifique" on conductor's side. #7303-7312 are ex-D&H 7303-7312 (1988-1991) / Ex-Guilford/D&H 220-231 (1984-1988) #Ex-D&H 7314-7325 (1976-1984) / Built as Lehigh Valley 314-325 in 1972. #7316 & 7321 were scrapped in 1993 by CP Rail after extensive damage occurred in seperate derailments. #7303 & 7304 still wear as of January 2016, D&H paint. Major update (s/n and b/d) to roster data provided by Michael Richmond. For detailed information on SOO GP38-2s visit Mark Hintz's SOO GP38-2 Roster. 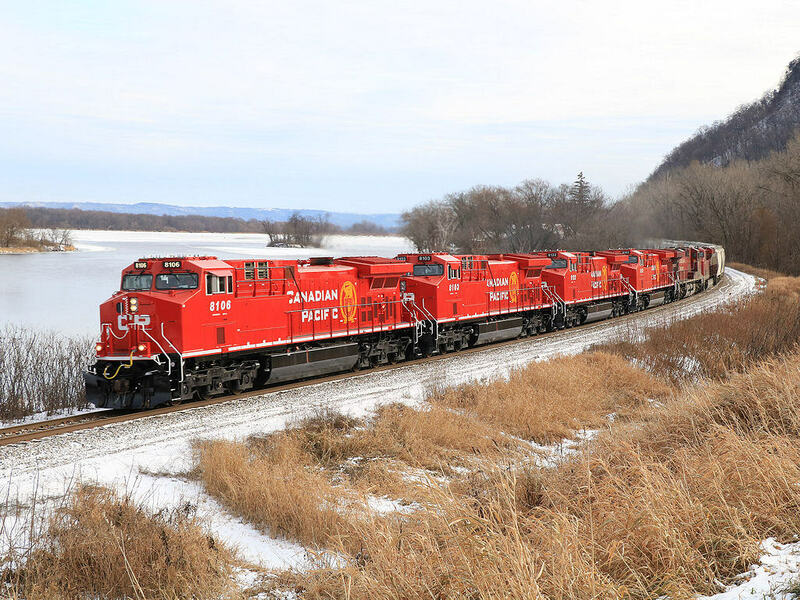 This roster includes US Heavy Haul (Soo Line), St. Lawrence & Hudson (D&H) and other subsidiaries. Units owned by/lettered for StL&H are not marked as such because the assignments change frequently. Serial number data provided by Michael Richmond. Sean-Graham Whites on-going reporting of new locomotive orders is appreciated. Thanks to the following people for updates/corrections: Scott Arentzen, Rainer Auer, Christian Base, Ken Borg, Thomas Boyer, Andy Cassiidy, Shane Darst, Brent Erdmann, David Everard, Joe Ferguson (via LocoNotes), David Howarth, Jr.; Fred Hyde, John Gabriel Ibay, Alex Jiricek, Bryan Jones, Todd Jones, Tom Keeping, Kenneth Larson, Doug Lister, Jeff Mast, Paul T. Nadolski, Drew Neidig, Dave Nickson, Martin Oksnevad, Joe O'Mara, Dennis Parejko, Matt Petersen, Stephen Rees, Michael Richmond, Ray Sabo, Kevin Tweed, Ed Weisensel, and Jim Koglin. Additional Sources: "CTC Board", "Canadian Railway Observation" (E-zine); "Canadian Trackside Guide", "The Branchline Magazine", Bruce Chapman's CP list, and Bryce Lee's "Canada Calling Newsletter".